Back for its 3rd year, The Whisky Society event is an intimate tasting session for anyone remotely interested in whiskies. It first started off in 2015 as a private whisky tasting session for 150 people, serving just 10 scotch labels. In 2016, over 400 guests sampled more than 30 types of whiskies from all over. This year will feature not only whiskies, but also other spirits like rum, gin and sake. 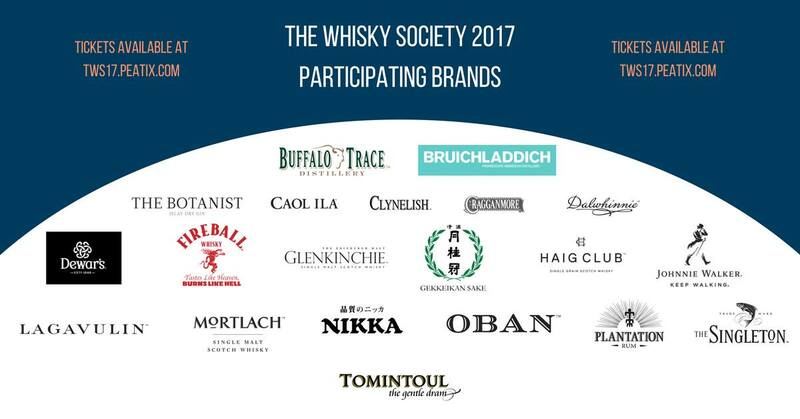 The Whisky Society 2017 will be held on 28 October 2017 (Saturday) from 2-10pm at the SOCIALMEX Hall (13A, Jalan Pelukis u1/46B, Temasya 18, Glenmarie). *Selected premium drams also available at the individual booths for an additional fee. Promo code: TWSANGELTINI for rm30 off the standard or premium tickets. Drink responsibly and stay safe okay! See you then! WIN TICKETS TO THE WHISKY SOCIETY 2017! 2. Tag a friend on my page and comment why you'd like to go. Contest ends at the end of the week - 22 October 2017 and other T&Cs apply (ie: I say so!). Winners will be PM-ed for personal details – so make sure your Facebook page is accessible for me to PM you!